Carmel has the look of a quaint English seaside village because the early settlers were British ex-pats who wanted to recreate their homeland. The 5,000 citizens who live here today no longer resemble rurals, but Jaguar and Land Rover owning environmental types (you need a permit to trim a shrub) from L.A. and San Francisco fleeing the rat race for the sake of Carmel's gorgeous beaches set against an indigo sky. Think pearl-white sand rimmed by biblical cypress trees where you can sit and watch the fog banks roll in exactly at cocktail hour. Take your dog for a run on the sand and forget the leashes. Pets are as welcome as people at most places (but you have to show a visa card). 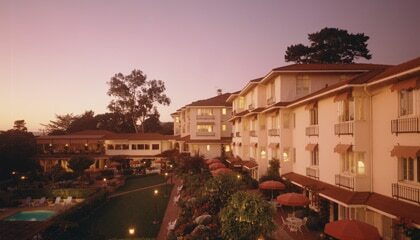 This Eden has numerous hotels but the best place to stay is the La Playa Carmel. Built as a stylish rockwork mansion in 1904 by Norwegian-born artist Chris Jorgensen for his bride, a daughter of the chocolate-famed Ghiradelli family, La Playa was converted into a hotel in 1916 and gradually enlarged over the years. Located in the middle of the primmest of prime real estate near Ocean Avenue galleries and shops and a few blocks from the sea, the property sprawls around an interior courtyard rife with private walks, gorgeous gardens exploding with purple bougainvillea and a heated pool. The residential feel of the hotel's coastal modern design is accented by pale pink-stuccoed walls, red tile roofs and a lobby featuring a large marble fireplace, European antiques and hand-loomed rugs. Guest rooms are large with views of the ocean and formal gardens and feature hand-carved furnishings incorporating the hotel's mermaid motif. 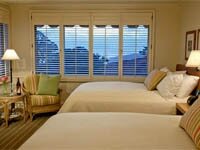 Guest cottages have large fireplaces, two bedrooms, complete kitchens, tons of storage alcoves and private patios. They run considerably more than single rooms but are perfect for families or two couples. No matter the location you can hear magical slapping of waves interspersed with obligatos of barking sea otters. Like Carmel itself, the La Playa creates a universe within a universe that relieves stress and invites contemplation. 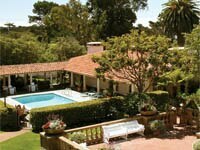 It's a wonderful headquarters from which to explore Point Lobos and the grandeur of the Big Sur coastline. True to Carmel's English rural tradition, nobody including the La Playa has a street address. Even the Carmelite nuns have to trot down to the post office for their mail. No matter. The U.K. should have it so good. Camino Real & Eighth Ave.
831-624-6476 | Reserve with Expedia for the best rate! Sip your way through wine country with GAYOT's list of charming inns and resorts, featuring vineyards from Napa Valley to Long Island, New York. Go off the beaten path and explore GAYOT's Top 10 Extreme Hotels, which feature one-of-a-kind accommodations for a truly unforgettable experience.